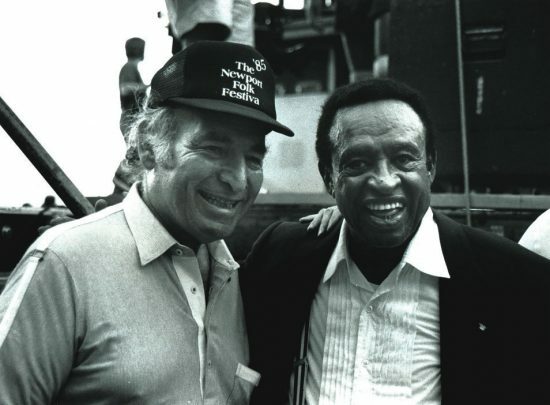 Editor’s Note: NEA Jazz Master and producer George Wein is always ready to talk about music, especially jazz. One afternoon, he was sitting around his Manhattan apartment with no one to talk to, so he put his thoughts to paper — thoughts about the return of his jazz festival to New York and the many people/venues that are helping to make it happen. It’s 2010 and George Wein is starting a blog! At almost 85, he’s seen, heard and experienced a lot, so he will probably just write whatever is on his mind and maybe your mind, too! Thanks for reading! The CareFusion Jazz Festival will be held in New York City from June 17 – 26, 2010. I first produced a jazz festival in New York in 1972. An incident at Newport the previous year, involving kids storming the stage, had meant for the time being it would be necessary to take the Newport Jazz Festival to an urban area. New York was barren in the summer, so 1972 saw me producing a June jazz festival for the next 36 years. When there was no jazz festival in 2009, I was quite amused to see a great deal of publicity bemoaning the fact, amused because for more than several years the critiques of the festival had been less than lukewarm. In fact, I was beginning to wonder why I continued to work so hard to produce an event that nobody in the jazz press seemed really to care about. In spite of this, when CareFusion, a leading global medical device company, sponsored my comeback to Newport in 2009, I suggested that maybe we should bring back a June jazz festival in NYC in 2010. They agreed. So here we are. The question is: why have a jazz festival in NYC when there is literally a cornucopia of jazz every night? In perusing the three publications, Jazz Inside New York, Hot House and All About Jazz New York, I realized that in the month of December 2009 alone, you could count up to 1,000 nights of jazz, Latin jazz-tinged music and Indie Rock (many fine jazz musicians are playing this music) appearing in clubs concerts, at schools and even free concerts. These events feature all styles of jazz from Vince Giordano’s band that so beautifully recreates the big band sounds of the 20’s and 30’s to the most contemporary sounds that can be heard many nights at the Jazz Gallery, a hidden upstairs space in an isolated section of Hudson Street, or on the lower West Side of Manhattan. It’s interesting that at the same time as all this is happening, 12 months a year in New York City, that some writers who have a voice in national press are spreading the rumor that jazz is dead. It is true that most of these venues are small. But does this mean death for jazz? I spent many nights in my youth as often as I could get to NYC. 52nd St. was a Mecca for me. It was the late 30s and early 40’s before I went in the Army (1943) to help end war forever!! I heard Coleman Hawkins, Art Tatum, and the Count Basie Orchestra to name a few. Towards the end of the 40’s, after my service, I was still going to 52nd St., and Dizzy, Bird and Miles and so many more had been added to the mix. But none of the venues on 52nd Street and the other clubs I frequented in NY held more than 100-150 people. I didn’t know it at the time, but the musicians were “well” paid! They made as much as $40 a week (sometimes). But jazz dead? No way. It was alive, well, incubating and leading up to the concert and festival era and in a sense the first major institution for jazz funded by the cultural billions of dollars now available in NY (JALC) and even to the President of the United States bringing jazz to Stockholm for the Nobel Prize awards. So is jazz any more in the throes of expiring than it has ever been? I don’t think so. Thousands of young men and women are dedicating their lives to this music. JALC is perhaps the single most important and best financed venue for jazz in the city, but it doesn’t begin to encompass the energy that is pouring out of talented musicians of all ages every night in NYC. If I were to gather this energy to create a unique New York jazz festival I would need help – a lot of help. What I noticed in checking out the jazz scene over many nights out on the town was that in addition to the plethora of musical creativity, there had developed a group of young producers who were totally enmeshed with jazz that was directing their lives. So I realized I could take advantage of that. Here was the help I needed. At the Jazz Gallery I met Rio Sakairi who has a reading on the pulse of the young experimenting musicians in the city. Rio was quick to come to my aid. We have produced six evenings at the Jazz Gallery that will enhance the image of what jazz is in NYC. At the Jazz Standard, I encountered Seth Abramson who works with more established artists at Danny Meyer’s rib joint, which has become, along with the Vanguard, the Blue Note, Iridium and Birdland, one of the preeminent jazz clubs in the Apple. We will do five evenings there. I felt jazz should have more of an exposure uptown, so I asked Laura Kaminsky of Symphony Space to work with me. We have produced some interesting concerts which include the contribution of Eric Offner and the Bechet Society. While recognizing youth, I still believe jazz is a noun from J to Z.
Harlem had to be on the agenda. I asked Pat Cruz at the Harlem Gatehouse and we have several concerts there. In addition, over the years we have established a tradition of presenting concerts at the Schomburg Center and The Studio Museum in Harlem. Both Howard Dodson and Thelma Golden, respectively, were eager to be part of the CareFusion Jazz Festival. Brice Rosenbloom and Simon Rentner are two young entrepreneurs who work at Le Poisson Rouge. They have a multitude of ideas, so we are doing several nights there. In addition, Brice and Simon will produce a concert at historic Town Hall. CareFusion asked if it were possible to do something in Central Park. We approached Central Park SummerStage, and after a meeting with James Burke and Erika Elliot, we have come up with one of the most exciting free jazz concerts New York will ever see. What about Brooklyn? I keep hearing that there is an exciting jazz scene over the bridge. So one night a few weeks ago, New Festival Productions team members Bennett Jackson and John Phillips and I headed off to check it out. At Zebulon I met Jef Soubiron, who runs the club along with his brother Joce. We were greeted by Olivier Conan at Barbès and at Puppet, Jaime Affoumado was happy to see us. So we will have at least nine or 10 nights of jazz in this energized metropolis. In addition, for several years we have established a tradition of including a free concert in Prospect Park. We are working with Jack Walsh and Rachel Chanoff. This will continue. In Queens, working with Michael Cogswell of the Louis Armstrong House to produce a fulfilling program for Pops’ fans at the Armstrong House has been a rewarding experience. This will be one of the highlights of the CareFusion Jazz Festival New York. The finale of the festival will be a midnight jam session hosted by my old friend, Michael Dorf at his beautiful new City Winery. One important concern – I want to make jazz concerts available to the young fan who does not have as much money to spend in his/her pocket. I have asked all these venues to charge only $15.00 admission with no additional minimum. For the majority of locations, this will be the case. In addition, we will have a limited number of tickets priced at $15 for our bigger concerts at Carnegie Hall. These will be important events and in several cases the artists performing will be making their only NYC appearance of the year. On January 9th I attended several Winterfest Jazz Festival events on Bleecker Street in the Village. Thousands of predominantly young fans filled the street going from club to club, enjoying pure jazz. I hadn’t seen such energy for a genre of music since the folk scene in Greenwich Village when Dylan, Peter, Paul and Marry, The Clancy Brothers and many other wonderful artists were emerging. I was very impressed by the spirit and energy and I think it bodes well for the future of jazz. So that is a short description of the CareFusion Jazz Festival New York and how I hope to make the world ever more aware that NYC is the jazz capital of the world and to acknowledge the people who work so hard to make this a continuing effort.